If you want to make an investment in a piece of biochar production equipment, you may have a general idea about how this equipment can bring you and the great prospect the biochar making machine has. The biggest problem for you is possibly how to choose the right machine and a suitable manufacturer. Because a good machine can bring you a lot of benefits more than you think. Here I would like sharing with you some information, and hoping they can be useful for you to make the right decision. Here are more parameters of Beston biochar production equipment for sale. For our biochar making machine, the charcoal yield rate is 4:1, and if the quality of the raw material is pretty high, the out yield rate can reach 3:1. But all those will happen under the condition that all the materials can reach to standard to be processed. The size is about 40-50 mm, and the water content is below 20%. Speaking of the raw materials, our biochar furnace can handle various kinds of biomass waste, such as rice husk, straw, coconut shell, palm kernel shell and so on. We call this equipment as environmental protection machine for the reason that the whole biochar production process produces no pollution. This process consists of high-temperature pyrolysis, gas volatile, sulfur emission and carbon enrichment. More detailed information is listed here. 1. Convey the raw materials to the carbonization host. You need to make sure that the size and the water content of raw materials are suitable. 2. When the charcoal making process starts, the combustible gas is produced. Then it enters the condensation analyzer system after being processed by the cyclone dust remover and spray dust collector. After this process, you can get wood tar and wood vinegar. 3. The purified combustible gas will be recycled to heat the carbonization host. 4. The charcoal will be discharged after the cooling process. Here is a video about showing the working process of Beston biochar production equipment. 1. The charcoal from biomass has a higher carbon content than the common charcoal. So it is perfect if you use it as fuel, because it will not cause any pollution. 2. Biochar is free of odor and toxic, so it is widely used in food industry, such as BBQ. 3. You can also use biomass charcoal to improve the quality of soil. 4. Moreover, it is quite common for people to process the biomass charcoal into activated carbon. 5. As for the wood tar and vinegar, they are good chemical raw material. You can directly sell them out. Why Is Beston Biochar Production Technology Better? 1. It uses the combustible gas as heating sources, and the amount of combustible gas can satisfy the demand. If you use coal or other fossil fuel, it is certain that the air pollution will become more and more serious. 2. We equip the biochar equipment with the pressure and temperature timely display system, so you can monitor the machine and make sure that its working condition is safe. 3. The water cooling system can make sure that the temperature of the charcoal will not be high. So the whole working process will be safer. More and more people have realized the greatness of the biochar making machine. Recently, we played a host to a customer from Kenya, and he was quite satisfied with our machine and technology. 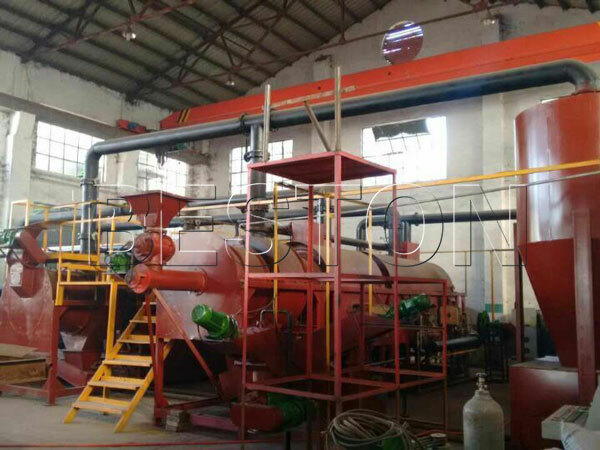 If you have the desire to make an investment in such biochar production equipment, or you want to know more details, you can contact us at any time. We will reply you as soon as possible.